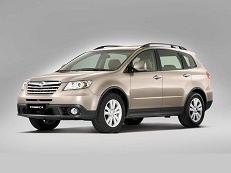 Correct Wheel Sizes, PCD, Offset, Rims and Tire specs for Subaru Tribeca series. 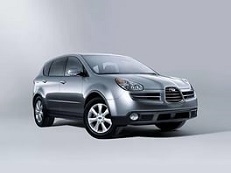 Hi, I have a 2006 Subaru B9 Tribeca and for my winter tires/wheels I have acquired a set of Mazda CX 9 - 7 spoke wheels. What do I need to do to put them on? Do I need spacers? or other wheel nuts? or?? Any help/info would be appreciated. What is the size of Tribeca spare tire?